THE STORY: Hammerhead Island, pop. 27. This community of fishermen, their wives and children, have no official organized government nor any police force to ward off crime. When the gruesome accidental death of one of their most beloved citizens, kindly “Preacher” Phineas Benson, turns out to be murder they find themselves with a dilemma. Do they call in the police from the mainland or deal with the crime themselves? It’s up to Jeremiah Corbett, the oldest and most respected leader, to investigate and decide whether the islanders’ “eye for an eye” philosophy should be instituted in meting out Justice. THE CHARACTERS: Death on the Outer Shoal (1934) is another surprising discovery in a subgenre I like to call country noir. 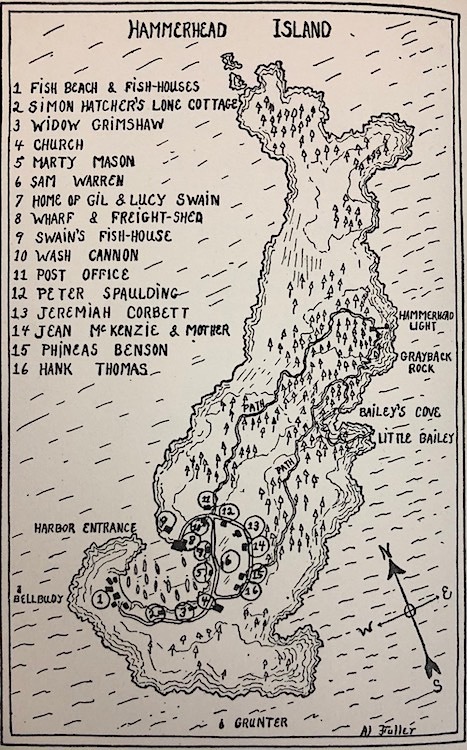 The rural community on Hammerhead Island is perfectly rendered in every detail from the rigorous descriptions of trawl fishing to the finely tuned ear for New England regionalisms and speech patterns that accent the characters’ dialogue. Jeremiah (Uncle Jerry) Corbett is ostensibly the protagonist but this novel seems more like an ensemble theater piece with each of the supporting character getting their moment to shine. Jean McKenzie, a young nurse who as the only medical professional on Hammerhead acts as the surrogate coroner to help Corbett. Jean verifies that the wounds in Benson's neck are not made by the fisherman's gaff stuck there but by a knife because the stab marks have clean edges and go deeper than the gaff's pronged hook. She also finds contusions on his scalp that prove he was stunned by a blunt object in order that Benson could be arranged in the nets near the gaff and then stabbed to give the appearance of an accident. There are gossipy women spying on the Committee men, Otto Wolfe the irascible lighthouse keeper with grudges aplenty, and Hank Thomas, the local alcoholic and wife beater all who have riveting scenes with Corbett. Widow Grimshaw is perhaps the remarkable figure among the many supporting players. Following the death of her husband Captain Grimshaw she has gone into a permanent state of grief dressing only in black, disappearing into a huge hooded cloak, sporting a scowl cemented into her wizened face. As far as most people are concerned her interminable grieving and anger led to a spiraling descent into madness. The way Fuller and Allen describe her she might as well have stepped out of a Nathaniel Hawthorne story. If her appearance were not foreboding enough Widow Grimshaw points her accusing crone’s finger and lets loose with regular tirades denouncing everyone in sight. She is like some Puritanical witchfinder with a fervent desire for vicious retribution. She has a habit of heaping her curse on anyone who dares antagonize her. Her antipathy to all allows for the introduction of another sinister influence – the collective hatred toward the Portuguese fishermen who live in nearby mainland town of Byport. While the Widow’s is the ugliest of bigotry expressed in dialogue, for her niece married one of the immigrants, none of the others on Hammerhead are too fond of the Portuguese either. Nick Dianno and his family tend to be singled out by name regularly. Nick is viewed as an opportunistic wheeler-dealer looking for his chance to buy up land. In the estimation of the citizens that will only ruin the heritage and life of Hammerhead Island and everyone is determined to keep the Portuguese off the island. INNOVATIONS: The idea that an entire community needs to turn detective to root out an evil scourge is something that you usually find in horror fiction. The preservation of the land's purity, their insular lifestyle, and the inhabitants' desire to keep out foreigners and "outsiders" smacks of the kind of secrets that made fictional places like Cornwall Coombe, Summerisle and Crowhaven Farm the kind of town you'd never call home. And though most likely unintended it was hard to dismiss the vigilante mentality of how Justice prevails on Hammerhead Island. Too often someone quotes the Biblical "eye for an eye" concept that serves as the citizens' primary code of morality. There are shades of not only Hawthorne here, but eerily prescient hints of the plots of modern thrillers like Harvest Home, Shirley Jackson's "The Lottery" and even Death Wish. When Hank Thomas is brought before the Committee for drunkenness and wife beating then punished with a beating by a leather thronged scourge I cannot help but think that the authors intended this to be taken as a scene of appalling horror, especially considering that Hank is lashed five times by each of the five Committee members. It's an unexpectedly brutal scene that had me gasping. When it's all over and Hank is about to leave the tavern backroom where he received his beating he breaks down and weeps uncontrollably. It's a mix of horror and sympathy that I was both unprepared for and a bit awed by. 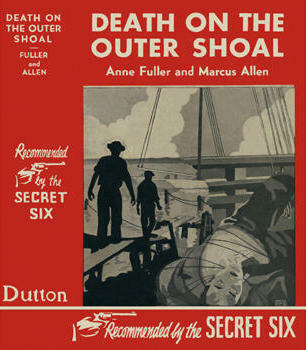 Death on the Outer Shoal was published by E. P. Dutton as part of their "Dutton Clue" imprint. Included in this book is one of the standard "Stop!" pages that challenge the reader to pause, collect up all their notes (if they made any), think over all the clues presented and try to solve the mystery. This is, in fact, a rare example of a very fairly clued mystery from Dutton. Some clues are subtle, others blatant and it might be rather easy for a veteran detective novel reader to weed out the correct killer from all the suspects. But the full truth may also come as a real surprise when all is revealed. The ultimate Justice is even a bit ironic with a subversive rather than an Old Testament touch. QUOTES: Widow Grimshaw: "Am I the only one who speaks to the [Portuguese]? Is Hammerhead the only spot for meeting and talking--and planning? The world is wide. Thieves find straight paths to each other." "If I but knew [who killed my husband]!" Her old face became hideous with hate. "On him I would heap my curses--curses, not of words, but of blood--and Death!" Soon the little harbor echoed with the throb of engines, and the Hammerhead fleet of trawlers was once more on its straggling way toward the fishing grounds. In each boat was a man dreading the night, whose dark, uncertain hours stretched ahead of him, and yet glad that here, at last, was work to be done. And in each home on the sea-beaten island, an anxious woman wished silently that her man was safe within doors, and prayed that he might come back to her with the next day's sun. THE AUTHORS: I could find little biographical data on Anne Fuller and Marcus Allen. I have an inkling that they were perhaps married, but that may not be true at all. My only clues come from the dedication pages in their two mystery novels. Their first mystery Blood on Common Ground (1933) is dedicated to Al Fuller, clearly a relative of Anne's (husband? son? brother?) 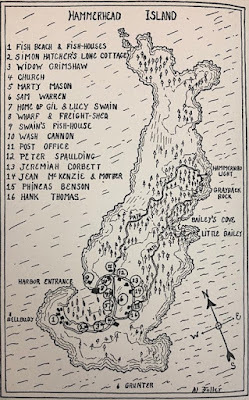 and also the artist who drew and signed the frontispiece map of Hammerhead Island that illustrates this post. However a bigger clue appears on the dedication page of this novel which reads "To Louise and Richard Connell." Could that be the same Richard Connell who wrote the iconic short story "The Most Dangerous Game" I asked myself? Indeed it is. Richard Connell was married to Louise Herrick Fox in 1919. Louise, like her husband, was a writer and at one time a playwright. Later she became involved in the publishing world first as a proofreader and then a prominent editor for Condé Nast publications. When Connell decided to give up his amazingly prolific career as a short story writer (close to 200 stories appeared between 1929 to 1940) he opted as many writers did for the life of a Hollywood screenwriter. He and Louise eventually settled in Beverly Hills. Could Fuller and Allen have been part of the movie scene during the 1930s when this book was written? When Connell was just reaching the height of his popularity as a writer of scripts and stories for moviemakers? Death on the Outer Shoal certainly has a very cinematic feel with its dramatic fishing and boating scenes, the setting of the island itself including the lighthouse and cliffsides, the often heightened dialogue, and an exciting courtroom-like finale. It could've made a gripping movie and might have been written as a scenario prior to it becoming a novel. Anyone who has knowledge about these writing duo your input will be greatly appreciated for filling in the missing details. I'm wondering what the "Recommended by the Secret Six" on the cover face and spine is all about. It's a marketing gimmick. 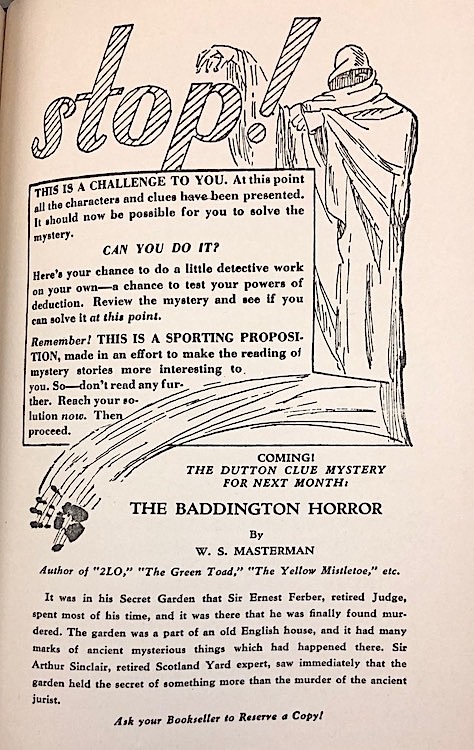 "The Secret Six" was the name given to the group of editors who worked on the Dutton Clue imprint at the publishing house. 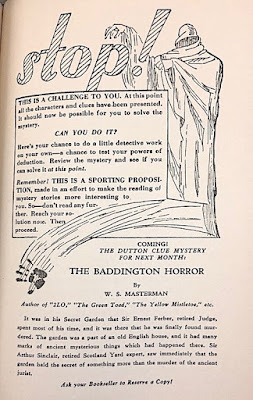 The phrase was emblazoned across the monthly Dutton Clue mystery book's dust jacket during 1934 only then disappeared. The imprint only lasted five years. Completely unrelated is a 1931 gangster film called The Secret 6. This is probably where the editors got the idea for their nickname. It was Agatha Christie, Dorothy L. Sayers, Dashiell Hammett, G. K. Chesterton, S. S. Van Dine and Sax Rohmer. My theory! LOL, I have this book on the bedside table, but still haven't gotten around to reading it after having it for several years. But at least it finally made it to the bedside table!